Walter DE La Mare (25 April 1873 - 22 June 1956) was an English poet, short story writer and novelist, probably best remembered for his works for children and "The Listeners". He lived with his wife Elfrida (Elfie) Ingpenin and children at Montpelier Row, Twickenham, the same street where Alfred Tennyson, 1st Baron Tennyson had lived a century earlier. De la Mare described two distinct "types" of imagination : the childlike and the boylike. It was at the border between the two that Shakespeare, Dante, and the rest of the great poets lay. 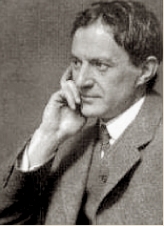 De la Mare claimed that all children fall into the category of having a childlike imagination at first, which is usually replaced at some point in their lives. Facts to them are the liveliest of chameleons . . . They are contemplatives, solitaries, fakirs, who sink again and again out of the noise and fever of existence and into a waking vision." The increasing intrusions of the external world upon the mind, however, frighten the childlike imagination, which "retires like a shocked snail into its shell." From then onward the boyish imagination flourishes, the "intellectual, analytical type." By adulthood (de la Mare proposed), the childlike imagination has either retreated for ever or grown bold enough to face the real world. Thus emerge the two extremes of the spectrum of adult minds: the mind molded by the boylike is "logical" and "deductive." That shaped by the childlike becomes "intuitive, inductive." De la Mare's summary of this distinction is, "The one knows that beauty is truth, the other reveals that truth is beauty." Another way he puts it is that the visionary's source of poetry is within, while the intellectual's sources are without — external — in "action, knowledge of things, and experience,"